This year’s Trivia Night will be 2/5/15. 8PM-8AM. You ready? Do not proceed if: you are faint of heart, spirit, fervor, or funk. To participate in Trivia Night, you need a TEAM. Said team can have as many people as you want – there are no limits. Teams greater than seven are recommended. Sign ups will be during the first hour of the competition, 8 – 9 PM. To register, call in at the provided number (this will come later). 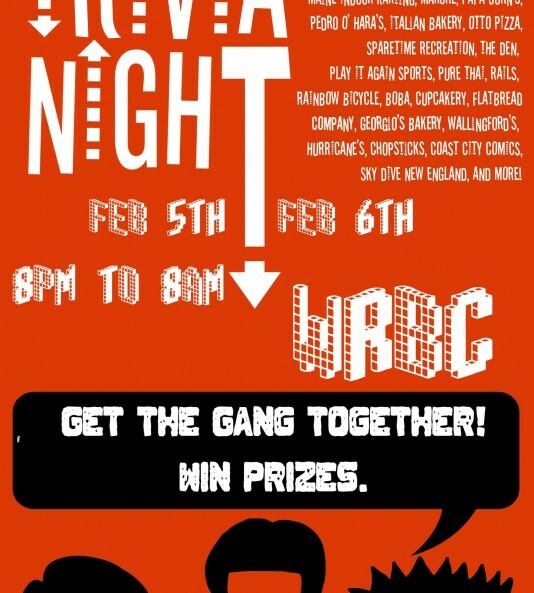 Also necessary: a knack for figuring out the obscure songs and trivia questions that WRBC throws at you. Each team is evaluated according to how many points they win. 2) The real excitement begins with PHYSICAL CHALLENGES. So maybe you didn’t know in which state it was illegal for mourners at a wake to eat more than three sandwiches? Well, luckily, you can earn more points through a random assortment of Physical Challenges, which are announced on the hour, and then performed on the half hour at the WRBC studio. Winners of Physical Challenges are given 15 points, 2nd Place 10 points, and 3rd Place 5 points. These challenges are judged by trivia night staff. 3) Make sure you’re paying attention, you don’t want to miss: Random points events. Because we’re nice people, sometimes points will be offered for certain random thangs. These could really help you out, especially if you’re creative and listening carefully. So be on the look out!